Who doesn't want their kid to eat more vegetables? Pretty much every parent wishes their child ate better, accepting new foods when they are painstakingly prepared by mommy, slaving over a hot stove all day... No? Just broccoli? I thought so... Today, you're in luck because I was recently able to get some valuable information out of the author of the book It's Not About the Broccoli, Dr. Dina Rose, Ph.D. Dr. Rose is a sociologist, parent educator and child-feeding expert. Her goal is to empower parents to raise kids who eat well, with both health and enjoyment in mind. Through my lunch-planning service, MOMables, I create healthy and fresh school lunch plans for busy parents who want their children to eat well during the school day. Parents ask me every day about the best ways to introduce new foods to picky eaters as they struggle to get their children to eat the new foods they're presenting to them. I asked Dr. Rose a few questions about introducing foods to kids without a battle so that we could all have a bit more success in feeding our children a healthy diet with a larger variety of foods. MOMables: We know kids need food to be fun, but how do we make tasting a new food more fun? Dr. Dina Rose: You don't always have to stick to healthy items like asparagus and fish. Go to the ice cream parlor and sample new flavors of ice cream! Crack open a box of unfamiliar crackers! One surefire way to get kids psyched about trying new foods is to amp up the fun factor. I know that getting your kids to like more of these kinds of foods seems counterproductive, but it's not. It will help change your children's attitude towards new, and that's the goal. Dr. Dina Rose: Yes, trust that your children will naturally start eating new foods after they become comfortable tasters. It takes a lot of courage to put something into your mouth when you know absolutely nothing about it, and the information most parents give their kids -- "yum, this is good" -- just doesn't cut it. Being able to make predictions is key to trying new foods. Practice telling your children as much as you can about whatever food you want them to taste. "This is crunchy like the chicken nuggets you like." "This is sweet, almost like a cookie." Then, instead of asking your children if they like what they've tasted, ask them to describe something about the food. MOMables: How do they get past the initial resistance to try something new? 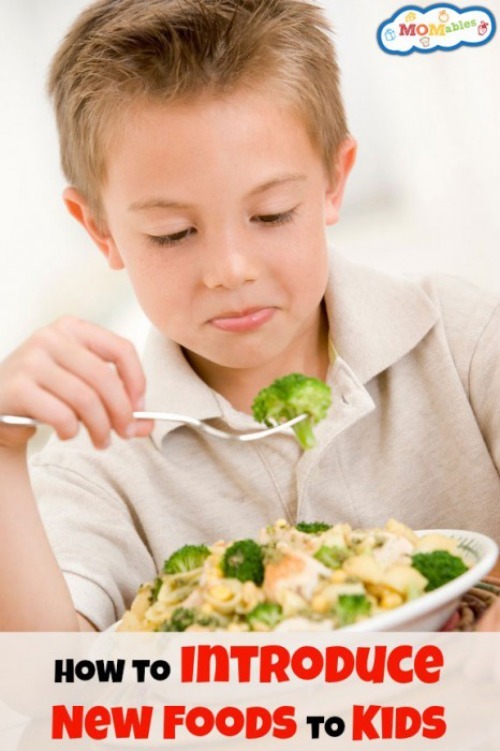 Dr. Dina Rose: Never (and I mean never) ask your children to eat anything new! Settle for a taste. Or a touch. Or maybe even just a sniff. When it comes to teaching kids to enjoy new foods, pressure is your enemy. And -- at least from our kid's perspective -- being expected to eat something they've never tasted before is a lot of pressure. The shift from eating to tasting may not seem like a big deal. Most parents think that's what they're doing when they say to their kids, "Just taste it, and if you don't like it, you don't have to eat it." But if you hear this statement from your child's perspective -- "If you do like it, you will have to eat it" -- it's easier to see why some kids balk. Especially if you introduce new foods the way most parents do, by putting a big heap on the plate at dinner. What if your child doesn't want to eat it, or even thinks he might not want to eat it? The safest course of action is to not even taste it. 2. Take the surprise out of new foods. 3. Trust that your children will naturally start eating new foods after they become comfortable tasters. And she leaves us with this: "As your children become accustomed to tasting new foods, they'll naturally want to taste even more new foods. And tasting will eventually lead to eating. No question about it." Since interviewing Dr. Rose, I've been able to integrate some of her advice into our daily lives and I have to say my kids are turning into better 'tasters' themselves, although they've always been coerced into trying my recipes so they're pretty adventurous to begin with! What about you? Have you tried any of the above advice? What works for you to get your kids trying new foods in and out of the lunchbox?